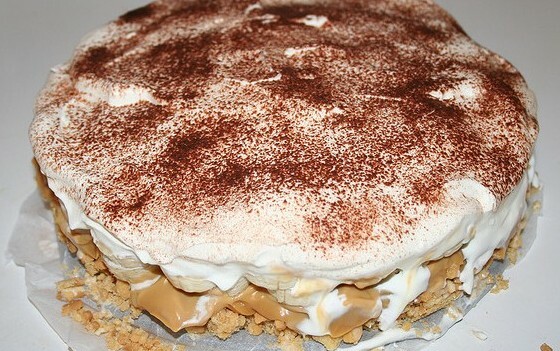 If I had to pick one item I couldn’t do without, it would be Banoffee Pie Face Fudge. I’m literally hooked on this stuff. It all started one night with my best friend, Fran Katz, who runs the absolutely brilliant company Pie In The Sky. That’s what makes her such a fantastic businesswoman. Six months later Pie In The Sky had a full ‘Banoffee Pie’ range of gels, foams, pastes, scrapes and body crusts. They’re really funky, and all the ingredients are fair trade. The face fudge is my favourite. I walk around all day surrounded by that lovely smell of banana and toffee. It reminds me of good times, and it seems to give off the most amazing positive vibes. Only the other day a guy in a pin-striped suit came up to me in the street and said he’d like to lick my face.